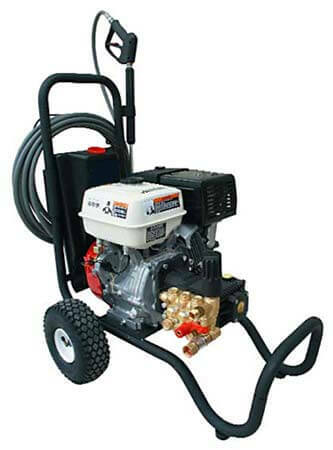 When cold water economy is a must and electricity is not available, Ultimate Washer offers a wide range of gasoline powered cold water power washer models. Durably constructed and extremely mobile, all models include triplex plunger pump with ceramic plungers and stainless steel valves, thermal relief valve, and trigger gun with 36" wand. This washer is ideal for use in the rental, construction and contract cleaning industries. The Cart Mounted unit is a premium quality, gas power washer that provides reliable cleaning performance and optimum mobility. By far our most popular machine produces 2,700-3,500 PSI and at 3.0 - 4.0 G.P.M. water flow and it has plenty of power for almost any job. This versatile unit is ideal for a variety of applications from commercial to industrial needs. Car Mounted models are one of our lightest units featuring a Briggs Vanguard, Intec and HONDA industrial grade engine. Portable power or maximum mobility? ....actually, we give you both. If you have any questions regarding the model differences or technical specifications please call our Customer Service Line at Toll Free 866-858-4982 or send us an email at: info@ultimatewasher.com.